Artificial Systems Bio-Inspired are models based on biological systems. The main protagonists of Bio-Inspired system there are the Artificial Neural Networks. They are mathematical models constructed to simulate (via software or directly on the microchip) the operation of the circuits Biological nervous. The key element underlying nervous central system (the brain) is the neuron. The neuron are connected to each other through a dense network of connections that allows the exchange of information. This dense network of neurons takes precisely the name of biological neural network. You might ask you: "We must build an electronic brain?" That is simple, we can take a neuron, we can Simulate its operation , copy these networks and that is it '! It is not so easy! I always think, if the nature take billions of years of evolution to build a complex machine like the brain it is not so easy make one of it in a small laboratory in a few time! The issue becomes even more complicated when you consider that if you start from the brain functionality you can easily arrive to philosophy issues that inevitably involve the very complex definition of intelligence. This is the reason because today there isn’t a clear definition on which all scientist are agree (And I don’t know if there will be one in the future). But the fact is not surprising because the definition of intelligence is inevitably linked to the mystery of our very existence of which clearly we know nothing (In other case it shouldn’t be a mystery!). Our brain is composed of neurons (and now I think this is clear!). On average these neurons are equal in number to 100 billion (about 10 times the world population). 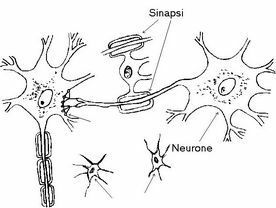 Each neuron is connected with about 10,000 neurons and communicate with them through the synapses. In this site we’ll show mainly the PC simulation of artificial neural networks. To do that, clearly we can’t fail by small describing of biological models that somehow these networks are inspired. There are many science fiction films where the filmmakers imagine that there are super advanced artificial machines so similar to us that they can even take the upper hand on mankind like it became in Terminator or Matrix films. We, however, these futuristic machines, at least for now, leave away. We'll study instead of some examples of use of artificial neural networks (such as optical character recognition) and try to explain why in many field to resolve certain specific problems, artificial neural networks are so precious!